Craft beers deserve a crafty carrier. 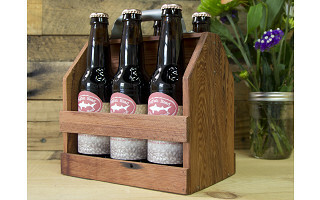 Wood Thumb’s handmade tote, built with salvaged wood, is the perfect vessel to showcase the artisanship of craft brews. The creators are Christopher and David Steinrueck, who started the Wood Thumb community of entrepreneurs and artists. The two brothers created their first wood neckties from an old redwood beam they found in a salvage yard. Today, all of Wood Thumb’s products are designed, manufactured and packed in their San Francisco warehouse, and most of the materials come from reclaimed wood sources around the Bay Area. For beer lovers, the six-pack carrier is perfect for bringing a selection of craft beer to a friend’s house or an outdoor party. The carriers can accommodate traditional tall bottles as well as short, wide bottles, and a steel handle provides a secure grip. 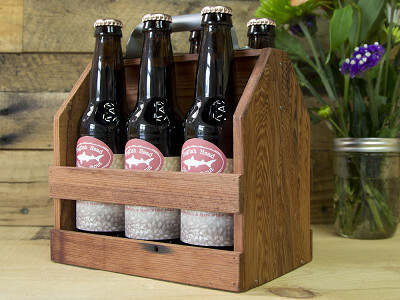 No matter which bottles you’re toting, the Wood Thumb six-pack carrier makes a crafty statement. Chris here from Wood Thumb. My brother and I set up a small factory in San Francisco, and make awesome stuff out of reclaimed wood. We hope you enjoy our products and we're happy to answer questions! Feel free to contact Grommet customer support at [email protected] and they can connect you with any information you may need from Chris. Fantastic idea! This is the power of our community - always letting us and our Grommet partners know how they can improve a product. Have you seen our recent Grommet launch Brewsees? Could be the perfect compliment to this. a bottle opener would be a fantastic addition. Good luck, and again, nice product! Another way would be to tie a simple cheap "Church Key" to the handle and let it hang inside. Craft beers deserve a crafty carrier. Wood Thumb’s handmade tote, built with salvaged wood, is the perfect vessel to showcase the artisanship of craft brews. The creators are Christopher and David Steinrueck, who started the Wood Thumb community of entrepreneurs and artists. 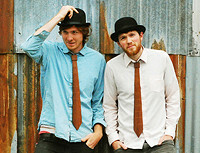 The two brothers created their first wood neckties from an old redwood beam they found in a salvage yard. Today, all of Wood Thumb’s products are designed, manufactured and packed in their San Francisco warehouse, and most of the materials come from reclaimed wood sources around the Bay Area.